Chino Hills, Calif., November 6th, 2007 -- Well known FileMaker authors John Mark Osborne and Steven Blackwell are teaching the new FileMaker Training Series for FileMaker Pro 9 in San Jose, California and Newport Beach, California. The FileMaker Training Series is the official training curriculum from FileMaker, Inc. It offers a series of 12 training modules that cover a comprehensive set of topics designed to help you master the essentials of FileMaker solution development. This new series incorporates the many new features of the FileMaker 9 product line throughout the modules but stresses good programming skills for FileMaker 7, 8, 8.5 and 9. The Newport Beach, CA course is a special version of the FileMaker Training Series course consisting of new FileMaker 9 features, FileMaker Server 9 and Security. Each day of the class is $495.00. Take all five days and save $500.00! The Newport Beach course is only three days and does not qualify for a discount. The Newport Beach course also requires you to bring your own laptop computer. These courses are also offered privately. Just contact the phone number below for more information. "We have expanded upon the curriculum to include additional examples, points and concepts from our own experiences as trainers and developers", says John Mark Osborne. "We feel the additional material will assist students in grasping the material. In addition, Steven Blackwell will focus on FileMaker Server and Security like never before". John Mark Osborne has been working with FileMaker Pro for the last 17 years and has become one of the leading industry experts. John Mark is co-author of the wildly popular Scriptology book and CD ROM which has become the standard for FileMaker Pro developers. Recently, he received a prestigious award from FileMaker, Inc. for developing outstanding technical resources for his popular FileMaker Pro web site, Database Pros . 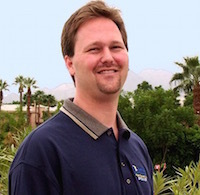 John Mark is also a regular speaker and trainer at MacWorld Expos and the FileMaker Developer Conference. Database Pros works closely with FileMaker, Inc. as one of 25 Platinum level FBA (FileMaker Business Alliance) members and 1 of 12 trainers authorized to teach the Professional Training Series from FileMaker, Inc. John Mark is a certified FileMaker 7 and 8 developer having passed both certification exams. Steven Blackwell is president and founder of Management Counseling Services. Steven has written a multitude of articles for FileMaker Advisor Magazine, white papers for FileMaker, Inc., a video on FileMaker security and the only book on FileMaker security ever written. Steven is a FileMaker 7 and 8 certified developer and one of 25 platinum level FBA (FileMaker Business Alliance) members. With 20 years experience in the FileMaker market, he is a legendary developer known by all. For more information on FileMaker Pro 9, available through computer resellers, visit .